We are blessed with a a large circle of friends. I was reminded of how wonderful they are yesterday when we had nine of our friends over for a fried chicken dinner complete with corn spoon bread, rice, black eyed peas, Swiss chard, cucumber salad and homemade jalapeno jelly. Everyone offered to bring something and all I really needed was dessert. Jen obliged with a coconut cake (my favorite!) and Kelly brought a awesome peach and raspberry pie (and some really pretty pumpkins so I could ‘autumn up’ my house). Ellen brought beautiful leaf-shaped votive holders and Kathy brought me a lovely bottle of cold pressed olive oil. Karen brought flowers and the Signature Cocktail For The Evening – the Farmer’s Marketini. That cocktail was a hit! 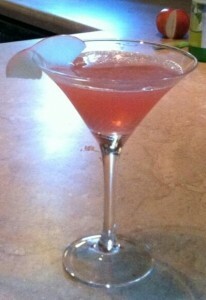 Everyone – girls and guys – enjoyed this pink drink served in a martini glass garnished with a slice of apple. Karen told me she was inspired when she saw the Thatcher’s™ Organic Apple Spice Liqueur display at our local liquor store. Using her iPhone she Googled cocktail recipes using the liqueur and found the Farmer’s Marketini. Fill a cocktail shaker halfway with ice, add Thatcher’s Organic Apple Spice, vodka, triple sec, cranberry juice and lime juice. Strain into a chilled martini glass and garnish with an apple slice. If you’re looking for an autumn alternative to the Cosmopolitan, this is it. What’s your favorite seasonal cocktail? Comment below!